In the era of Big Data, today’s investors have access to a massive amount of information that wasn’t available just a few years ago. The trick is harnessing it, structuring it, and making sense of it. Environmental, Social, and Governance (ESG) and intangible factors are more important than ever before. That’s because of a seismic shift in the source of corporate valuations since 1975. S&P 500 firm valuations have evolved: Where previously the majority of value was due to tangible assets, today the majority is due to intangible assets, according to a study by Ocean Tomo. ESG Big Data is a key asset to measure corporate performance on ESG and intangibles, because it offers an “outside-in” dataset that captures the world’s view of company behavior. New technologies, powered by artificial intelligence, can yield this essential data at scale. It is now possible to look at qualitative factors such as ESG issues using machine learning techniques. New research shows that an outside-in perspective can yield alpha generation. Companies with strong information flow, good overall ESG scores and positive ESG momentum outperform the S&P 500 and Russell 1000 benchmarks over a ten-year period, adding about 3% to 5% (300-500 bps) of alpha annually. Below are the results of that recent study using ESG data, excerpted from the white paper, Performance Tests of Truvalue Labs Insight, ESG Momentum, and Volume Signals. 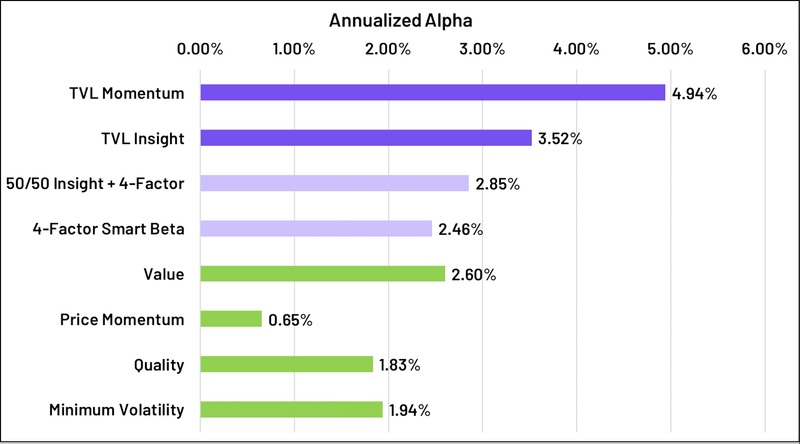 Portfolio constituents for this study were drawn from an underlying benchmark of Russell 1000 stocks, based on monthly composition of that benchmark at the time. The results that follow show the total return from a monthly rebalance of portfolio stocks, not including fees, transactions costs, commissions, taxes, or any other market frictions. The figure below shows the ramp-up of value over time for each portfolio. In both figures the Truvalue portfolios are compared to the Russell 1000 index (both cap-weighted and equal-weighted) as well as to two well-known ESG funds based on traditional ESG data. The Volume portfolio shows that companies with significant news flow around ESG factors tend to outperform their benchmark. The Volume Score on which the portfolio is based measures the information flow or number of articles for a company over the past 12 months. This Volume portfolio includes the top 50% of Russell 1000 stocks according to volume of stories tagged with any of the Truvalue Labs categories based on an ESG financial materiality framework created by the Sustainability Accounting Standards Board™ (SASB). The Truvalue Insight Score applies a moving average to the faster-moving, timely Truvalue Pulse score to produce a more stable metric of long-term performance. The Insight portfolio begins with the Volume portfolio then excludes the bottom 1/6 of companies with the lowest SASB Insight scores overall. The ESG Momentum score measures the direction of change in the Insight score over the past 12 months. The ESG Momentum portfolio begins with the constituents of the Insight portfolio and then narrows to those companies most likely to appreciate in price based on historical patterns of Insight and Momentum scores. For each portfolio, all stocks are equal-weighted and rebalanced at the start of each month. Stocks that drop out of the multi-factor screens and/or leave the Russell 1000 are dropped from the portfolio. Truvalue Labs’ AI engine combs through more than 100,000 third-party sources and identifies both positive and negative company actions. Daily calculations provide investors with timely, actionable data to inform their investment decisions. As described earlier, Truvalue Labs analyzes data within a framework developed by SASB. SASB has worked with stakeholders and industry experts to determine which ESG factors are the most material to company performance, by industry. The chart below shows performance of standalone and combination factor performance using Truvalue Labs data. Backtesting shows that the Truvalue Labs factors outperform many traditional quant factors and are additive to a multi-factor investment approach. Specifically, the Truvalue Labs SASB Insight and ESG Momentum scores provide a way to quantify many factors missed by traditional quantitative analyses. The signals also show low enough correlation to traditional quant signals, such as value, momentum, quality, and low volatility to be additive in a multi-factor combination. These results show the signals are effective tools for stock picking purposes and portfolio construction. ESG alpha findings also serve to suggest longer-term, fundamental value creation from ESG factors. 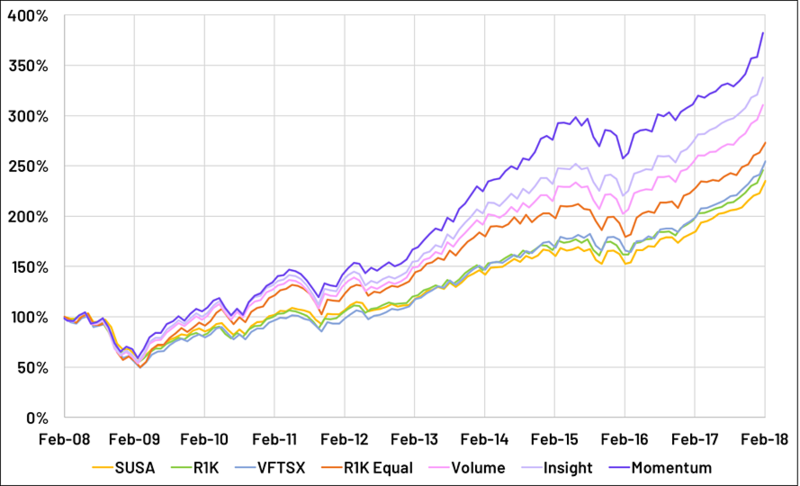 The chart below shows the annualized performance of these various portfolio strategies using TVL data compared to two well-known ESG funds, as well as the Russell 1000. Consistent negative exposure to value is one of the most interesting aspects of these new TVL Volume, Insight, and Momentum signals. Value exposure for the TVL Insight strategy ranges from 0 to -0.4, while value exposure for the TVL Momentum strategy dips to -0.6. These strong negative correlations suggest that TVL Insight and Momentum factors will combine well (i.e., increase risk-adjusted returns) with traditional quant strategies that lean heavily on value. Readers can download the full study white paper using this link. Stephen Malinak leads Truvalue Labs’ quantitative research team in applying artificial intelligence and machine learning techniques to create new financial signals from unstructured data. An industry leader in quantitative analytics, Stephen joined Truvalue Labs from Thomson Reuters, where he spearheaded the company’s quantitative analytics offering, StarMine, and developed over 15 quantitative models. He has an extensive track record of successful predictive models using widely varying techniques across numerous domains. Stephen attended college at the Massachusetts Institute of Technology where he received his S.B. in Electrical Engineering and Computer Science. Malinak went on to receive his Masters and PhD in Engineering-Economic Systems from Stanford University.